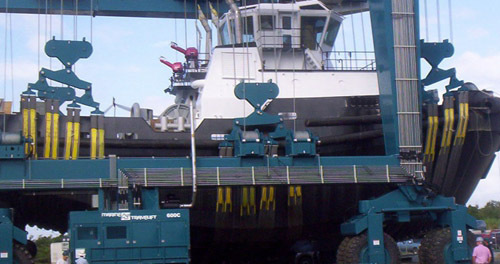 350 ton travel lift can lift large vessels stably and quickly. 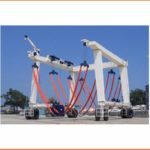 As a heavy duty marine travel lift, 350 ton boat hoist has complete safety protection devices, such as overload protection device, alarm device, over-speed protection device. 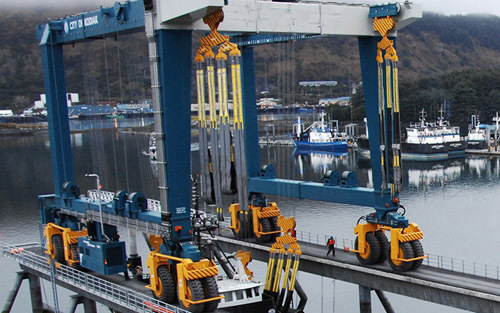 These devices can protect the operator from damage, and prolong crane’s service life. 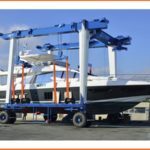 As an amphibious travel lift, 350 ton boat lift can be used for transporting the boat from one place to another place, and putting the boat into the water, and lifting the boat out off the water. It is also applied for construction site. 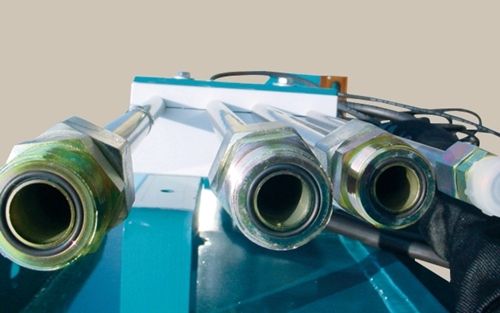 Our company is a great travel lift supplier and manufacturer in China. 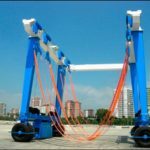 We provide types of travel lifts for sale, such as remote control travel lift, cabin control travel lift, amphibious travel lift, straddle travel lift, dock travel lift, electric boat hoist, hydraulic boat hoist. For any type of travel lifts, just contact us, and send quotation to sales@ellsentravellift.com, we will provide the perfect customized service for you! 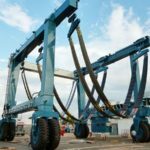 350 ton travel lift belongs to large boat lift crane. It has wide application in many places. And it has many types to adapt to the various conditions. 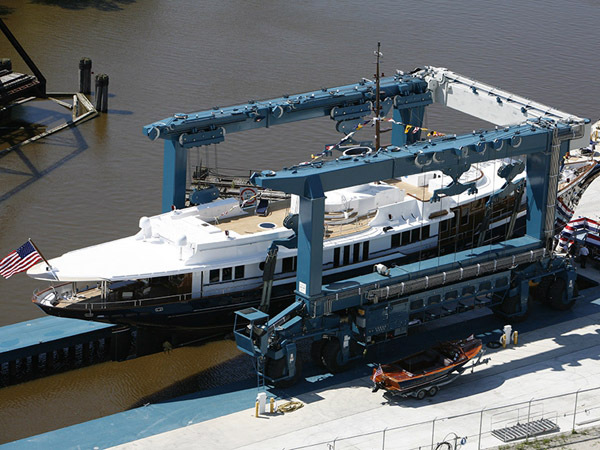 For operation ways, 350 ton boat hoist crane includes remote control travel lift and cabin control travel lift. Both of these two operation ways are safe and reliable. Cabin control is more popular. 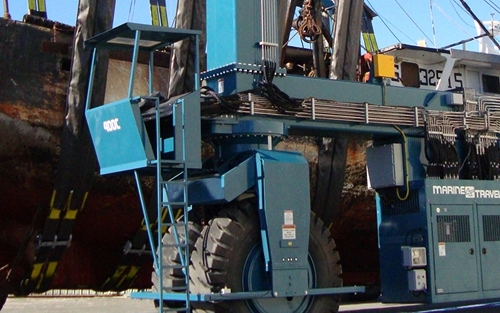 For most outdoor lifting work, cabin control means that the operator can sit in the cabin. 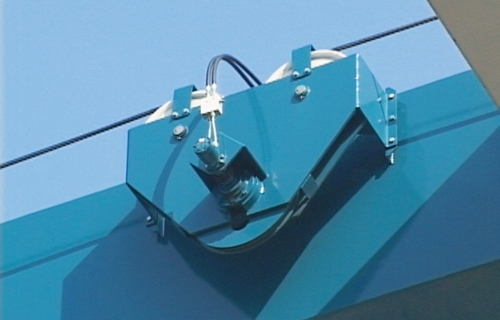 This ensures that the operator can move together with the travel lift, and protect the operator from damage, rain, sunshine or wind. 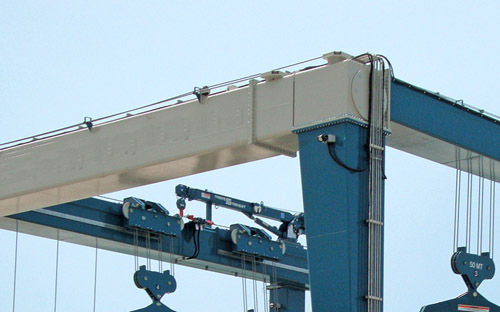 For power, 350 ton boat lift crane has electric travel lift and hydraulic travel lift. This is designed according to customers’ needs. 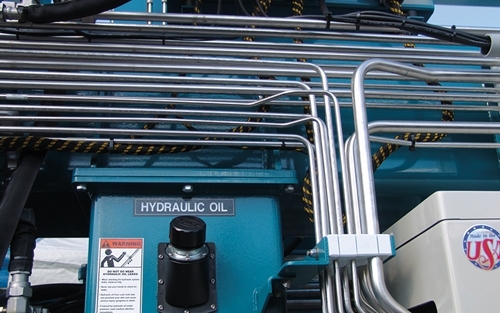 For heavier travel lift, hydraulic type is much powerful. 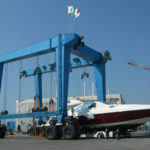 350 ton travel lift can be used as a marine travel lift and construction travel lift. The U shape makes it enough lifting room. It can lift the boat that is higher and wider than the travel lift frame. A number of traveling tyres makes heavy lifting flexible and smooth. 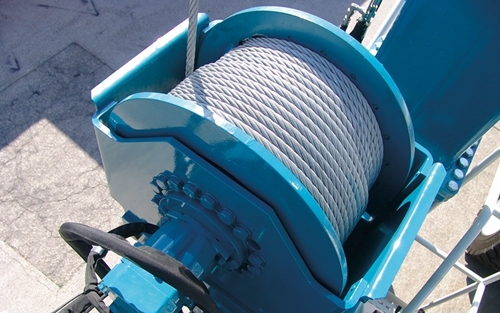 Durable slings can lift the boat stably and protect the boat from surface damage. 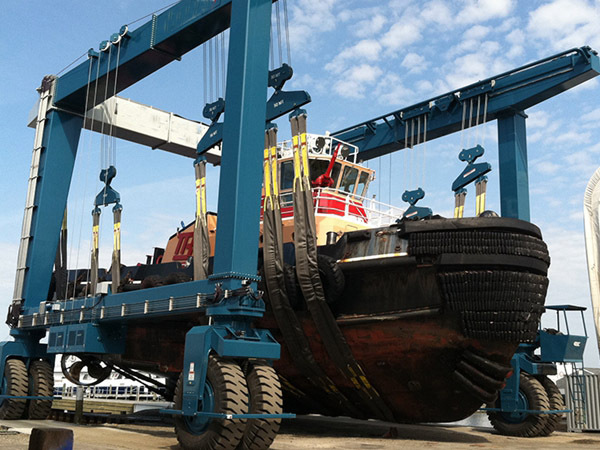 How does 350 ton travel lift lift the boat? 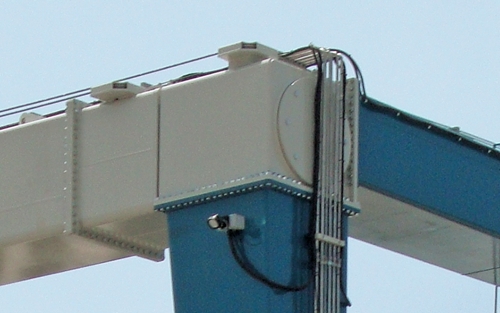 With direction from the spotter, the operator moves the travel-lift with the engine at no more than quarter throttle, into position centred over the boat to be lifted with slings separated if necessary. Placing pre-measured marker sticks perpendicular from the vessels centre line, fwd and aft, helps with centring travel-lift over boat’s centre line. Slings are positioned underneath the boat, aligned vertically with lifting points for that boat, and joined using strap pins with their safety cages in place and are facing away from the boat and secured with the safety pin. Forward and aft slings are raised slowly (mid throttle level) to a snug fit, just taking a small portion of the load. 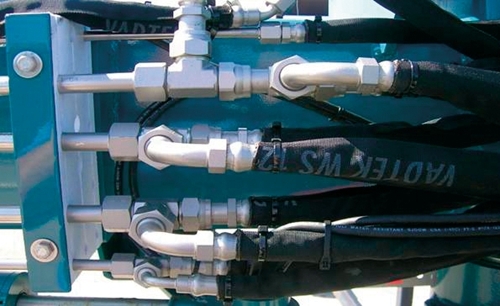 Safety lines are attached running forward from the aft sling and aft from the fwd sling and attached at deck level to the boat on both port and std sides. This will prevent slings from slipping fwd or aft on sloped surfaces. All four lifting points are raised until clear from supports and just high enough to clear any obstacles along the path to the lifting pound. While in transit lower to near ground level whenever possible. Adjust tilt and trim as necessary using individual lift points. With direction from the spotter, the operator moves the travel-lift with the engine at no more than quarter throttle, into position centred over the launch pound. Once in position the boat is lowered into the water until the load just comes off the slings. Note that additional hands are needed at this point to help guide lifting blocks over pound wheel guard. 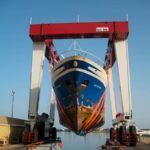 Before lowering the slings to the point where the boat can clear them and move out of the pound, the boat owner or representative is to go aboard to check for leaks, throw bow and stern lines ashore and untie the safety lines from the boat. 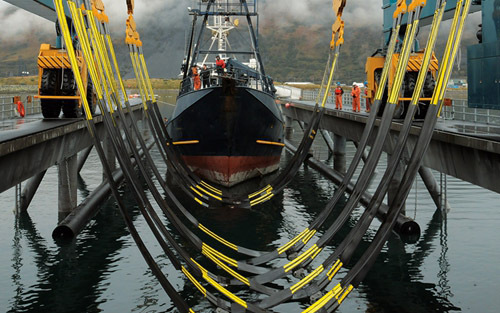 Once the launched boat is clear, the slings are raised to just above ground level. Again additional hands are needed at this point to help guide lifting blocks along inside walls of the pound and over the wheel guard. 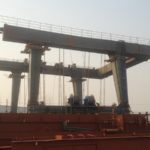 If no more vessels are to be launched, the travel lift should be parked with the aft wheels just of the concrete pad to allow for proper water drainage. 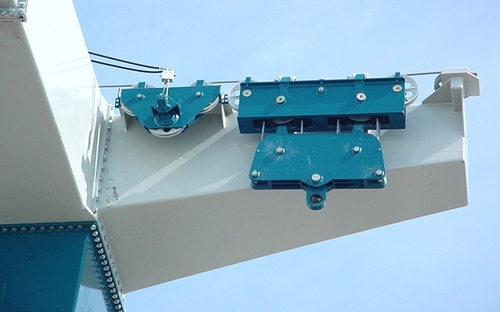 The slings should be tied to each other using the safety lines to prevent them from swinging in the wind and causing the lifting blocks to hit the travel lift’s frame.